Joining the likes of private-equity funds by Blackstone and SC Capital Partners, SiS Asset Management (SiSAM), a unit of Hong Kong-listed SiS International has set up a maiden fund to target distressed residential assets in Singapore, swooping in on undervalued or distressed homes a softening property market here. The fund known as the SiS Real Estate Opportunity Fund will not only explore other residential, commercial and hospitality assets in Singapore but also in other key Asian markets such as Japan and Hong Kong. In Singapore, due to loan curbs, the commercial property sector has also suffered. The plan is to buy and spruce up these properties, reposition their tenant mixes and then exit them at a profit, or reinvest that capital into other properties, or return capital early to investors, before the five-year deadline to avoid seller stamp duties. stamp duties. Unlike other typical real estate private equity funds, this platform has a much more conservative assets under management target of S$50 million. It comes with a five-year term plus two additional one-year extensions. It is targeting individual accredited investors by offering them smaller minimum subscription denominations of S$200,000 each. Two land parcels were released for sale on Wednesday (Sept 30) by the Urban Redevelopment Authority (URA). The parcel at Alexandra View is next to Redhill MRT station. Launched for sale under URA's ‘Confimed List,’ it can accommodate 400 units, with the first storey slated for commercial space. The tender for the 8,400 sq m parcel with a maximum gross floor area of 41,153 sq m will close at 12 pm on Nov 12. The other site located at Jalan Kandis, near Sembawang Park is made available for sale under the "Reserve List." It will be put up for sale if a developer's indicated minimum price is acceptable to the Government. The 7,047 sq m parcel with with a maximum gross floor area of 9,866 sq m can yield about 115 residential units. Both sites, which come under the 2nd Half 2015 Government Land Sales Programme, have 99-year leases. Newfort Realty had to incur some S$10 million in additional buyer's stamp duty (ABSD) plus two years back interest, when they proceeded to convert the freehold 68-unit residential project at 18 Mount Elizabeth Road into serviced apartments, since the property acquired in 2012 under the ABSD waiver had to be repaid. To avert the current abysmal residential market, Newfort Realty pulled the brakes on the planned freehold 68-unit residential project at 18 Mount Elizabeth Road, despite having paid the development charge (DC) of S$3.9 million and the show flat was almost ready. While it initially failed to obtain an approval for the conversion from the Urban Redevelopment Authority (URA), it succeeded in its subsequent appeals, given its commitment to keep the freehold property as a serviced residence for at least 50 years. But by not following through its intention to develop the property as a residential project for sale, Newfort Realty no longer qualifies for the additional buyer's stamp duty (ABSD) remission and hence incurred S$10 million for ABSD plus two years of interest (as the property was acquired in 2012). An additional S$25-30 million is spent on refurbishing and refitting the freehold estate into a 98-unit serviced residence, to be branded and managed under Oakwood. Newfort Realty paid S$92.2 million in 2012 to acquire the 37-unit freehold estate Chateau Eliza in a collective sale at a land price of S$1,743 psf per plot ratio. The DC was incurred to add more balcony space as part of saleable gross floor area as the existing property already exceeded its maximum plot ratio. But the lacklustre residential market prompted the developer to change tack. Since late 2011, developers here are required to develop the residential site and sell all the units under the development within five years, or pay the ABSD. For sites bought between Dec 8, 2011, and Jan 11, 2013, a 10% ABSD is payable. For sites bought from Jan 12, 2013, a 15% ABSD is payable. The ABSD, with interest at 5% per annum, becomes payable immediately upon expiry of the five-year deadline. Mortgagee sale of larger homes are on the rise, a consequence of stringent lending conditions, higher interest rates and a slumping leasing market. Though the pool of such buyers of prime properties may be small, strapped owners are often left with no choice but to let the banks step in and put the homes up for sale. 99 homes were put up for mortgagee sale in the first seven months of the year, up from the 51 in the same period in 2014 and 11 in 2013, according to an international property consultancy data. 18 landed homes went under the hammer in the seven months to July 31 this year, up from 10 in 2014 and seven in 2013. 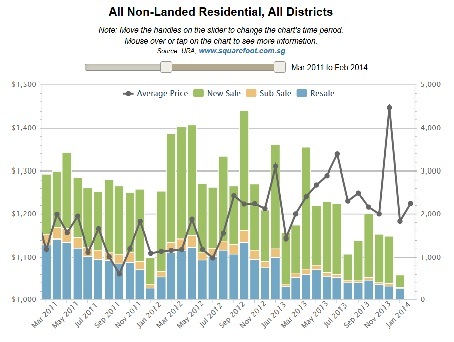 Most of the landed properties under auction sit on larger sites, like corner terrace, semi-detached or detached houses. Conditional approval by Land Dealing Unit for permanent residents. 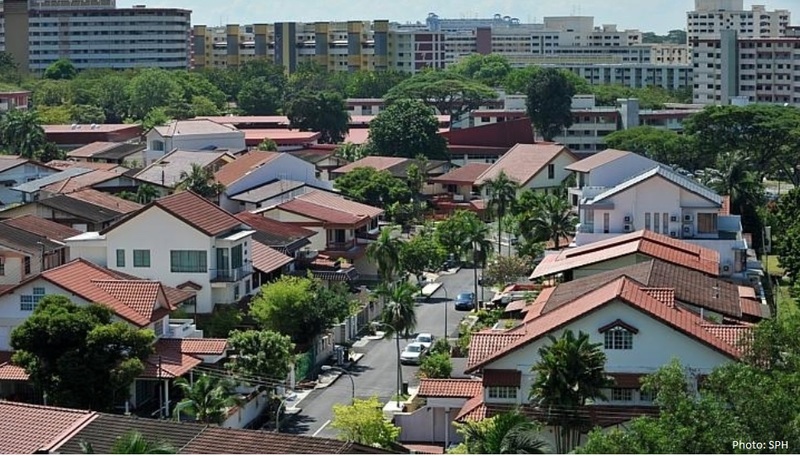 A good class bungalow (GCB) in Binjai Rise and a detached house in One Tree Hill went under the hammer in mortgagee sales in the seven months to July 31. No caveat were lodged for the bungalow, but the house in One Tree Hill sold for $9.38 million in June. An increasing number of apartments listed for mortgagee sale this year have been large, with floor areas of over 1,500 sq ft. Sizeable non-landed homes, popular during the market boom in 2007 and 2008, are now languishing away - suffering from a wane in demand by both foreign and local buying interest as a result of affordability concerns from the stringent loan curbs. Additionally, owners face difficulties finding tenants for these large units because of reduced housing budgets for expatriates. A 4,133 sq ft duplex penthouse at the Seascape in Sentosa Cove and a 1,873 sq ft Orchard Scotts unit were put up for auction. The Seascape unit sold for about $5.8 million in May, at a $5.2 million loss. The Orchard unit sold for $2.8 million in June, at a loss of about $824,000. Large apartments attract more owner-occupiers at auction. Smaller units appeal better to investors, treading warily in a softening rental market. Four-bedroom apartments in central locations are popular with owner-occupiers. They cost more and the buyers-pool is relatively small. 19 properties with a total value of $35.3 million were sold overall via mortgagee sale in the first seven months of the year, up from 12 homes valued at $15.7 million in 2014 and five properties worth $7.7 million in 2013.